Fran, from Spain, is part of the preparation team for the meeting. Here he shares some of his impressions shortly after his arrival in Santiago. The summer heat in Europe makes a contrast with the winter cold that welcomes us to Santiago, Chile. In the southern hemisphere, the winter grasps us suddenly. Splendid mountains surround this great city of nearly six million inhabitants. On one side the cordillera of the snow capped Andes is magnificent. It is surprising to find it so close to the city, when the cloud cover allows it to be seen. On the other side is the cordillera that separates Santiago from the coast; in the middle, the plain of the Mapocho river, where the city of Santiago stands. You feel very quickly protected by the Chileans. Their welcome – warm, close and simple – moves us, in contrast to the cold you feel in the streets. 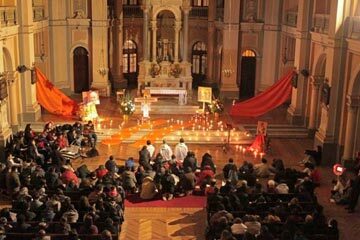 The Taizé brothers arrived in Santiago just a short time before the earthquake that shook Chile last February. Here, everybody tells how he or she experienced it. Chileans like sharing this difficult moment for their country, this tragic day. For several months now, the brothers have been getting to know the reality of Christian life in Santiago and in other cities. 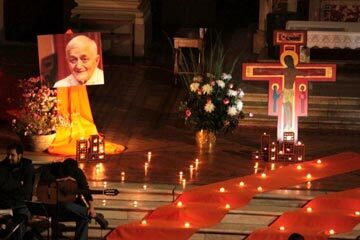 It was a great surprise to discover that the songs of Taizé are well known in the parishes and Christian communities. The people even know about the community of brothers and the life and writings of Brother Roger. The preparation for the meeting that will take place in Santiago at the end of the year continues to take shape. The pilgrimage of trust for a fraternal world is presented as an opportunity to deepen the personal awareness of the mystery of God for each Christian, through welcoming the pilgrims, and especially through the times of prayer. With the arrival of sisters of Saint Andrew and a group of volunteers from Spain, France, Italy, Argentina, Honduras, Maxico, Bolivia and… of course, from Chile! … the rhythm of the preparation has intensified. The preparation centre is situated in the Parish of Divine Providence, near the centre of the city. It is a charming historic building that was hit by the earthquake to the extent of losing its bell tower. For many people, this was a proof of the gravity of the quake. However, Chileans spend their lives “struggling” against the force of the earth and they are already working on the repairs to the church. Their efforts lead them to live full of hope and, with enthusiasm, they are happy to show who they are. Little by little we discover the pastoral work among the young through the “Vicaria de la Esperanza Joven” and we are surprised by the efforts made to provide training for the young. Chileans have a great sense of organisation. Likewise, the ecumenical fraternity is enthusiastic and gives much support to the celebration of the pilgrimage of trust for a fraternal world. Since the visits and prayers in the parishes began, some have expressed the desire to welcome young adults from neighbouring countries like Bolivia. Last Thursday, we organised a meeting and a time of prayer. The desire to meet others and to be reconciled is great, even if the relations between brother countries has not always been peaceful. A large number of Chiliens took part in the meeting held in 2007 in Cochabamba (Bolivia) where they were welcomed joyfully in the families! 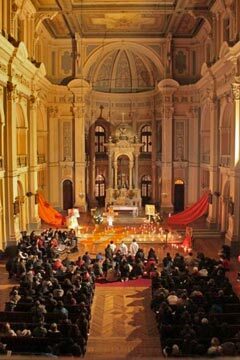 The next day, there took place the prayer for Chile, which the brothers have been leading since the month of March, in the Parish of Santa Clara du Vicariat Sud. The cold did not prevent the church from being full and the prayer around the cross lasted a long time. There were at least 500 people. On the Sunday, we had a prayer and a celebration of the Eucharist with songs from Taizé, in a parish where young people and adults have been meeting once a month for over 25 years. It is wonderful to be in a country where you are welcomed with open arms and where people express their desire to welcome those who have come from far away. The life of faith has marked the history of Chileans. The joy of being believers leads them to commit themselves in society. Now, they are finding joy in the deepening of personal prayer and in the strengthening of their relation with Christ. Some of them ask the brothers openly, “Teach us how to live the spirituality of the Gospel”.